Volkswagen has unveiled I.D., a highly automated electric able to cover a distance of 400 to 600 km on a single battery charge. The production version of the I.D. is due to be launched in 2020 at a price on a par with comparably powerful and well-equipped Golf. Volkswagen is looking even further ahead to 2025 when in "I.D. Pilot" mode, the electric car is capable of fully automated driving. VW says this technology should be ready for series production in 2025. 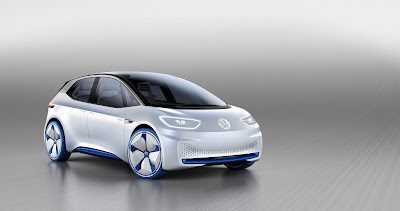 VW has also set itself the goal of selling a million electric cars a year by 2025; the production version of the I.D. will make a decisive contribution towards this in the ramp-up of e-mobility. The comany claims the car is as revolutionary as the Beetle of seven decades ago and the first Golf of 40 years ago. It adds that the architecture of the drivetrain with its electric motor on the rear axle, and a high-voltage battery in the floor of the vehicle, liberates more space, more light, greater flexibility and more freedom than possible in a car with a length of slightly over 4m. The I.D. is positioned as a compact electric car with which Volkswagen aims to expand its range of high-volume models in parallel to existing models such as the Polo, Golf, Tiguan and Passat. The four-door I.D. is 4,100 mm long and, thus, 155 mm shorter than a Golf. This concept car is 1,800 mm wide and 1,530 mm high. Between the front and rear sections the I.D. has a remarkable wheelbase of 2,750 mm; which is - despite the shorter exterior length - 130 mm more than the Golf. In fact, the wheelbase is closer to that of the Passat. In contrast, the body overhangs are extremely modest. The high-voltage battery used in the I.D. is located in the chassis. As a crucial link, the power electronics control the flow of high-voltage power between the motor and the battery. The power electronics module converts direct current (DC) stored in the battery into alternating current (AC) and a DC/DC converter supplies the on-board electronics with 12V power. Power is transferred from the motor to the rear axle via a single-gear transmission. The motor, power electronics and transmission form one compact unit. The position of the battery in the floor of the vehicle has a positive effect on the neutral handling characteristics, as it gives the I.D. a low centre of gravity. The I.D. has a weight distribution of 48:52 per cent. • Meanwhile, the University of Sheffield Advanced Manufacturing Research Centre (AMRC) has entered into a Memorandum of Understanding (MoU) with Ricardo plc. AMRC aims to develop innovative products and manufacturing methods for the automotive and vehicle production industry that will increase capacity, capability and competitiveness. The group’s longer term goal is to maintain the UK automotive industry as a world leader in advanced low emission powertrain and vehicle production. The MoU builds on a relationship between the AMRC and Ricardo, which started with Ricardo sponsoring a programme of doctoral students supported by the University of Sheffield’s Faculty of Engineering and AMRC. These studentships are jointly investigating electric motor design and manufacture. Beyond this there are no specific pointers as to where the MoU will lead. •Volkswagen's future may be 'electric and fully connected' but JaguarLandRover is not going to be left out, even aiming to take on Tesla. Jaguar's chief executive, and former BMW supremo, claims the company is developing its first all-electric car. Bearing in mind the company's present technology footprint the end product will be a first-class effort. Other Jaguar products will benefit front electric power.